Hemp seeds are prized as health food for their abundance of proteins and essential amino acids—but Mark Grosz of Oceanique, challenged by Campagnola's Vince DiBattista to create a dish with the ingredient, had never tried them before. "I'm not a health freak," he said. "But I brought [in] somebody who is." Grosz was referring to his friend Aryst Kirsch, who says he eats hemp seeds all the time: "I can eat them with a spoon. They're very rich in protein, so your body really craves, really likes [them]." Instead, Grosz and Kirsch created a vegetable soup (onion, carrot, potato, celery root, green peas, leek, cashews, and fresh spinach) that utilized hemp seeds two ways: ground seeds in the soup base, and whole toasted seeds as a garnish. To bump up the hemp flavor, they also added hemp oil (which comes from the seeds). In keeping with Oceanique's focus on seafood prepared in a French-American style, Grosz garnished the soup with steamed lobster and slices of black truffle poached in Madeira. He blended half the soup for a smooth, creamy texture, then finished it with sea salt, butter, creme fraiche, cayenne pepper, lemon juice, and diced ham. To serve, he poured the pureed soup into one side of a bowl and garnished it with lobster, truffles, and roasted hemp seeds; on the other side he added clear broth garnished with pea shoots. "You can't go wrong with truffles," Grosz said after tasting the soup. He also liked the flavor the hemp seeds contributed, which he compared to barley. Though he's never seen hemp seeds served in a restaurant, he'd consider doing it. "To put something on our menu we have to be really comfortable with it, and the soup is pretty close to being there," he said. Grosz has challenged Andy Motto of Quince to create a recipe with razor clams, a type of saltwater clam that's available seasonally. In a medium-size pot, heat water, ground hemp seeds, carrot, potato, celery root, cumin, bay leaf, onion, garlic, black pepper, turmeric, and two tablespoons of olive oil. Bring to a gentle boil, reduce heat to low, and simmer for 20 minutes or until vegetables are tender. Reserve vegetables for garnish. Divide the liquid in half, and add peas, spinach, and cashews to half. Simmer for ten minutes, remove from heat, add hemp oil, and blend until smooth and creamy. Season with sea salt, butter, creme fraiche, cayenne pepper, lemon juice, and ham. 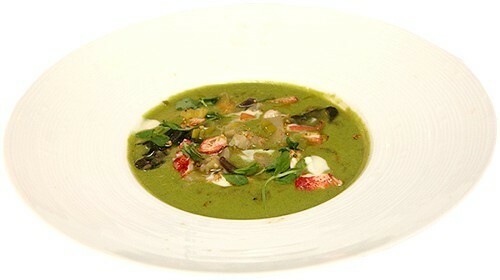 To serve, put blended soup on one side of the bowl and garnish with lobster, truffles, and roasted hemp seeds. Put clear broth on the other side of the bowl and garnish with pea shoots. Challenged to create a dish with razor clams, Andy Motto of Quince sticks to what he knows.